If you’ve got a good key lubricant handy, then you might as well clean the pivot rod and tube and relubricate. I use an automotive gear oil (not motor oil), but there are plenty of commercial key oils available for purchase if you prefer. 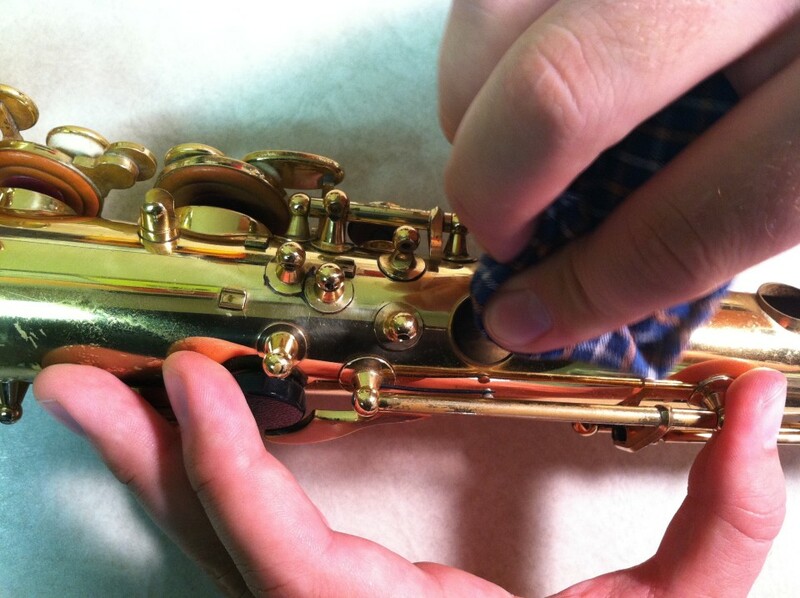 As a matter of policy, all instrument repairers disagree with each other on what you should use, so exercise your best judgment. Next, heat the pad cup to liquefy the glue or shellac. 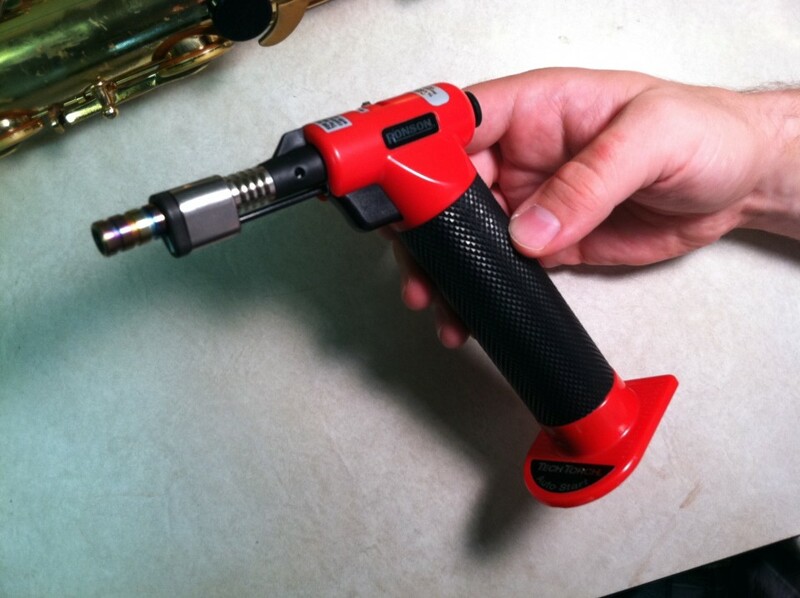 I use an inexpensive butane torch that I got from a hardware store. Too much heat can scorch the lacquer, so go slowly and be patient. 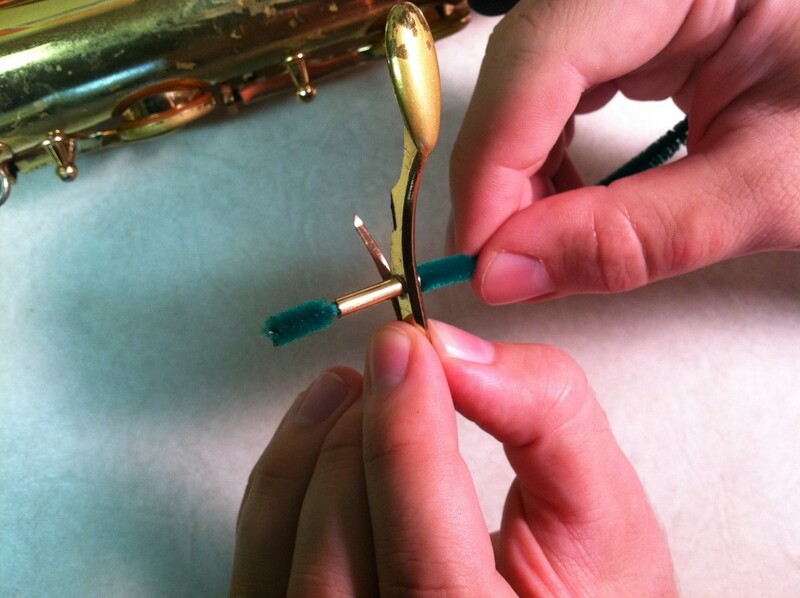 Often, when the glue starts to liquefy, the pad will start to lift out of the pad cup on its own. If not, you can poke the pad with something (not a finger—it’s hot) and see if it’s loose yet. The adhesive under this pad is clear, so it’s most likely the kind of glue that is used in hot glue guns. You can get it from a craft store. A brownish shellac is more traditional, but seems to be losing popularity. 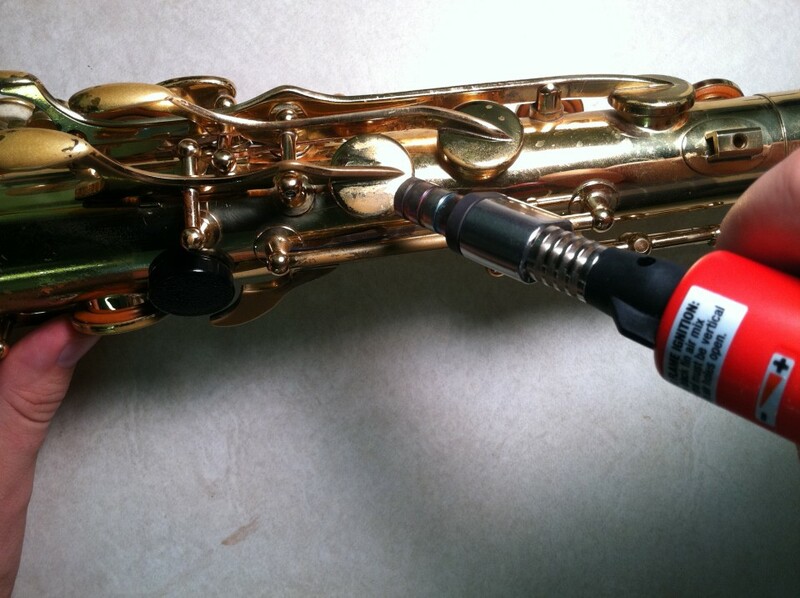 You can get it from places that sell instrument repair supplies. This pad has the size indicated right on it, so I know which size to replace it with. 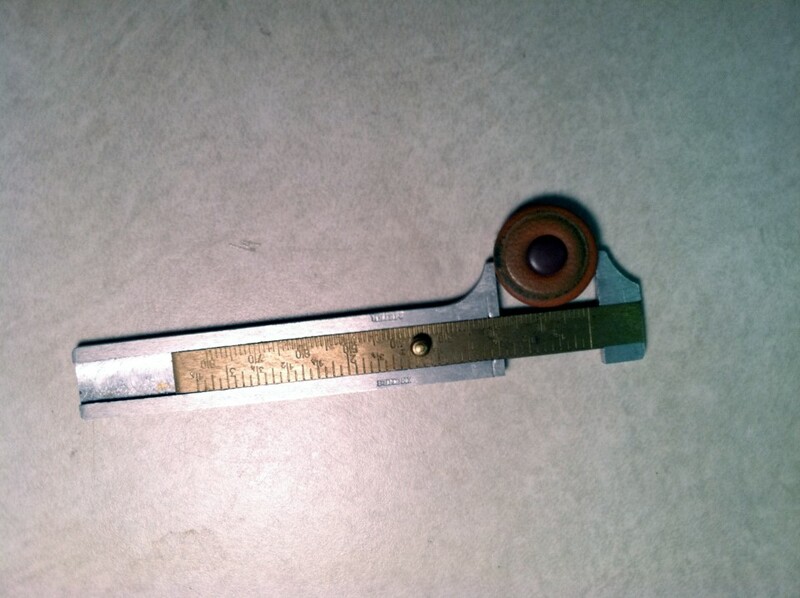 But pads are easy enough to measure, especially if you have a cheap caliper. Match the thickness of the original pad, too. MusicMedic.com is a good place to buy pads (and other supplies) for do-it-yourself repairs, since they will let you buy pads individually, instead of hundreds at a time. If you’re not in a hurry, you can take out the pads that need replacing, measure them, and then place an order for exactly what you need. The pads already on this horn are tan leather with a brown plastic resonator, so that’s what I’m replacing them with, but there are lots of other options. If you’ve already got pads and the adhesive is still warm enough to be in a liquid state, you can put the new pad right in. Otherwise you’ll need to reheat the pad cup first. 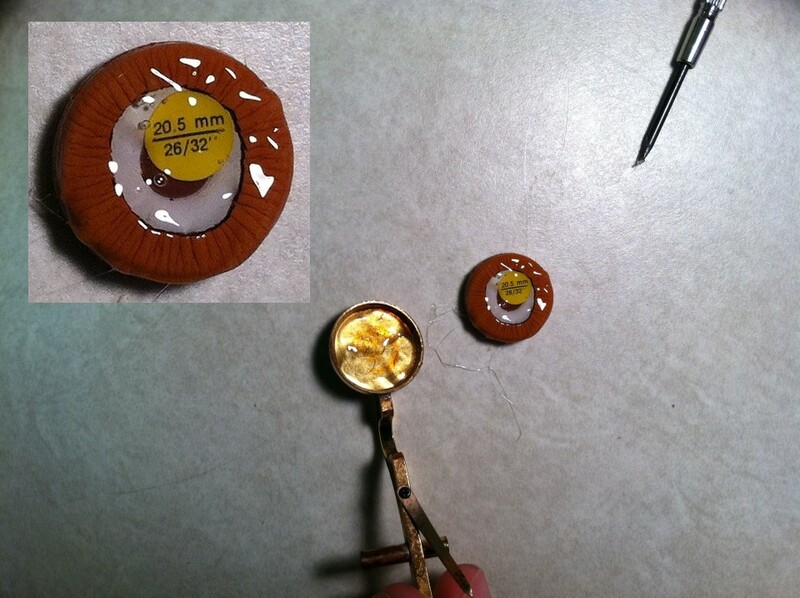 If you need to add adhesive, you can heat the pad cup and sort of paint some in there with the stick of glue or shellac. 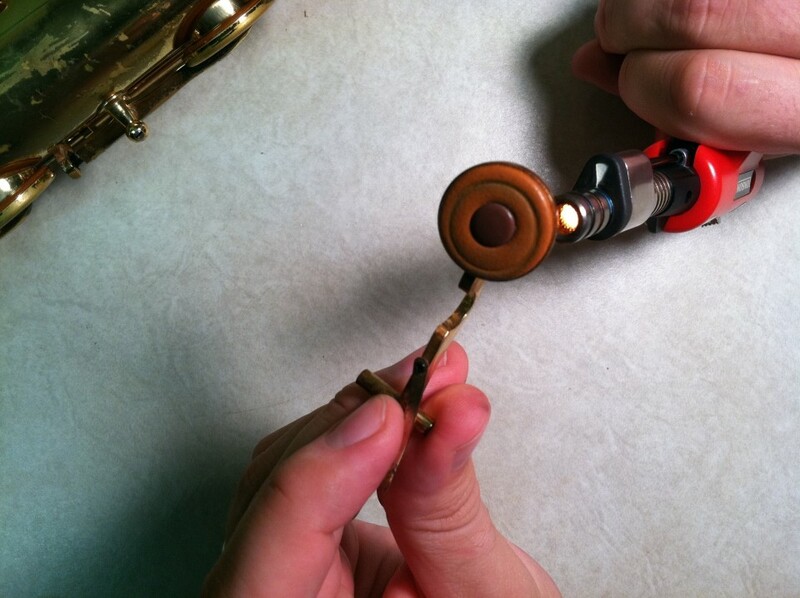 Or put some shavings from the stick into the pad cup and then heat it. Plop the new pad into place. 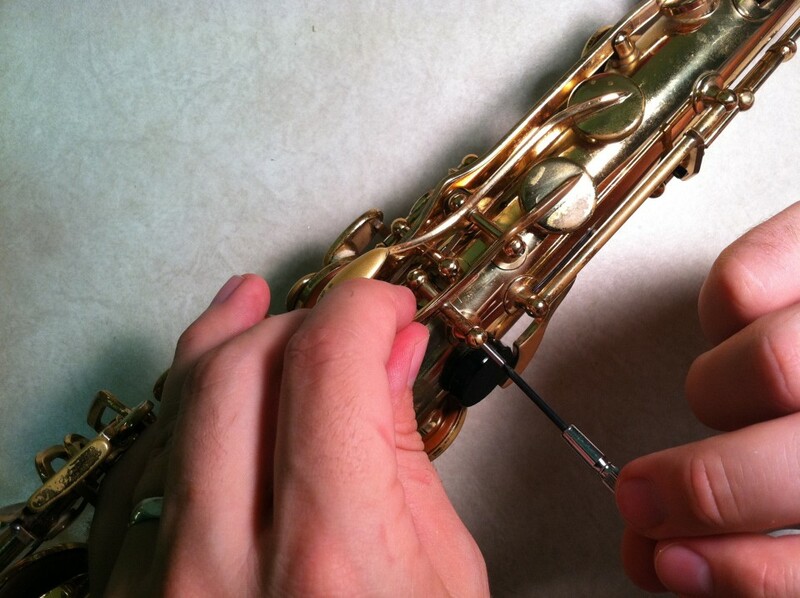 If you act quickly, you can put the key back on the instrument while the glue is still liquid, and the pad will hopefully settle right in. 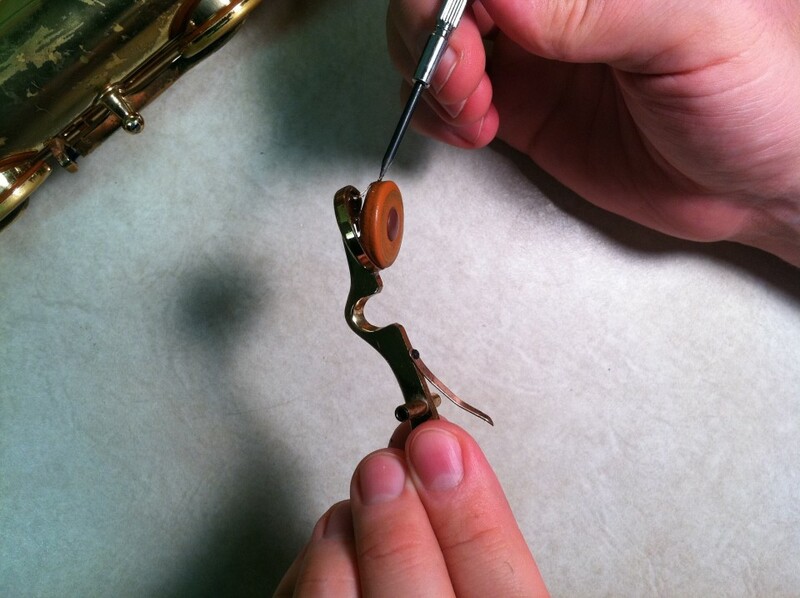 If you’re slow or if the pad doesn’t seem to be contacting the tonehole completely, add a little gentle heat to re-soften the glue, then press and release the key a few times. The pressure from the spring will help guide the pad into place. If the pad still seems to be leaking, you may have a pad that isn’t flat. 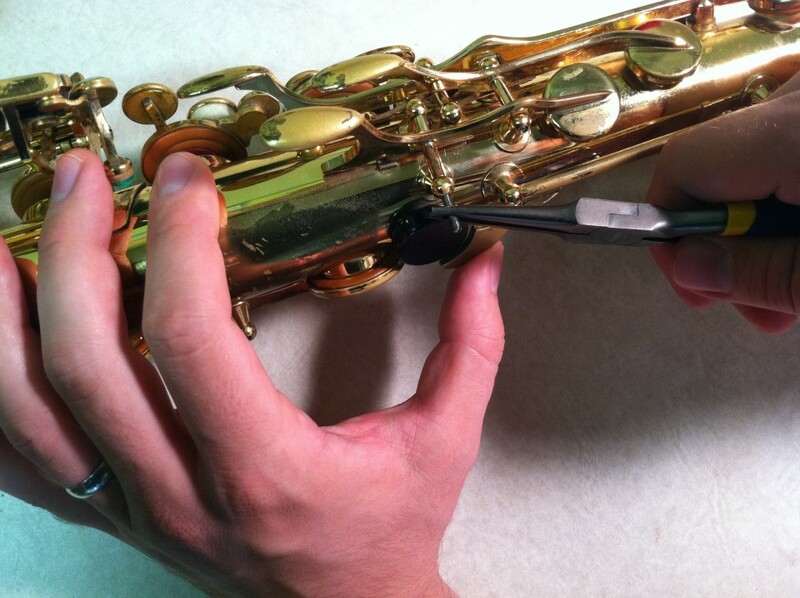 Or you may have a tonehole that isn’t level, or a key that is a little bent (either of these can be quickly and easily fixed by your favorite professional saxophone technician). But if the old pad was seating well, chances are that a good new one will, too. Let the glue cool thoroughly, and you’re all done! Nice job. 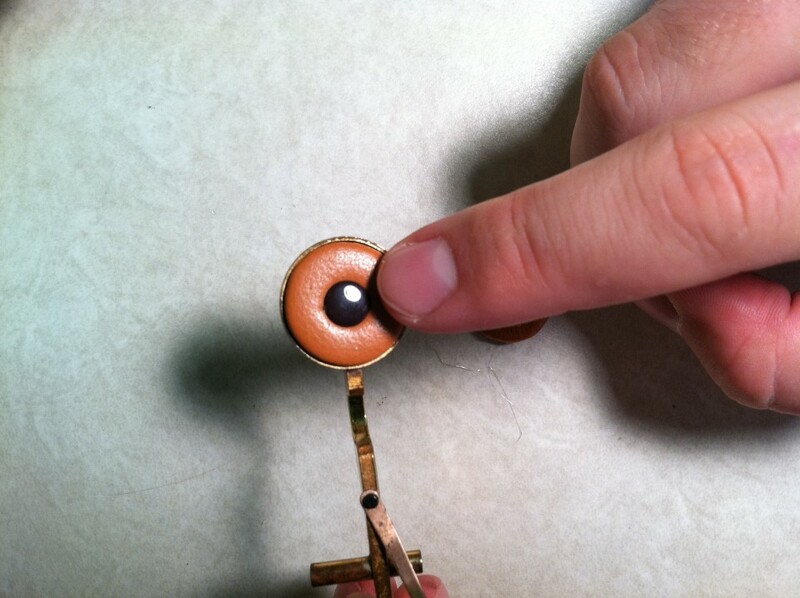 – If you stick a pin in the side of the pad and lift while heading the pad cup with a torch, you are likely to lift a higher percentage of the shellac (or glue) out of the pad cup when removing the pad. 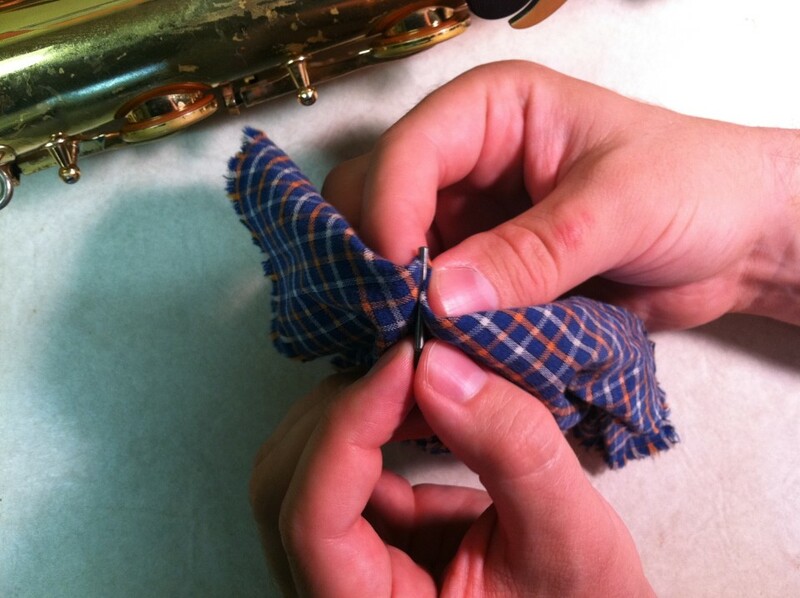 – You can further clean the pad cup once the pad is removed by heating it again and wiping the excess shellac from the inside with a shop rag. – Acetone is your best friend when it comes to cleaning the dirty oil off of arbors and shellac from pad cups. You can store a pint or so in a Nalgene bottle, since the acetone will likely slowly dissolve the inside of other types of plastic containers. Excellent tutorial. well done, thanks!